Where do you find wide, sandy beaches and dunes stretching for miles? Tiny, colorful fishing villages brimming with Celtic charm? And bays with tides so high that you can go walk on the ocean floor? Not in the Great White North, I thought. I was wrong. For these were only some of the treasures I have recently discovered in the "Far East" of Canada, a region commonly known as the Maritimes. Surrounded by the Atlantic ocean, and enjoying a temperate climate, the provinces of New Brunswick, Nova Scotia and tiny Prince Edward Island offer scenery and lifestyle one would expect of Ireland, or perhaps Wales. Living in their very own timezone, the people of the Maritimes enjoy a reputation of exceptional friendliness, which was field-proven when my attempt to jaywalk was met by motorists stopping and gesturing to me to cross at my leisure. We were off to a good start. Suitably reaching Price Edward Island by ferry, the island welcomed us with its trademark red rock cliffs, and continued to charm us with the bucolic mood so lovingly described in the classic Anne of Green Gables. The redhead orphan's home duly visited, my well-read companion and I spent a sunny October afternoon walking on a deserted beach. And when the sun set, we treated ourselves to a lavish, yet unpretentious lobster dinner, at which the boy from the landlocked country appreciated that the crustacean was conveniently served semi-peeled. Over the cool Confederation Bridge (which came at an even cooler price tag of $1.3bn), it was onward to New Brunswick, the only officially bilingual province and home to the world's highest tides in the Bay of Fundy. Just hours after walking out on the ocean floor at Hopewell Rocks (no beached lobsters, unfortunately), we were able to see our tracks in the sand covered by some 12 meters of water. The mind boggles at the thought of how much energy it takes to virtually empty and refill the entire bay twice a day. I imagine they turn it off outside of the tourist season. Our last stop was the city which does not exist, at least not on the moving maps aboard Swiss' jetliners. The anomaly is due to the extremely negative connotation the name Halifax still has in Swiss minds, even 14 years after the crash of Swissair 111. 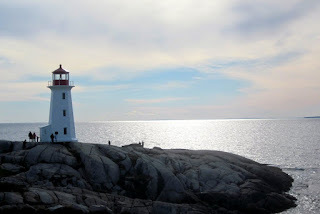 A visit to the memorial near the quaint fishing village of Peggy's Cove was a must. And despite having seen it on the evening news countless times back in 1998, I was taken by the solemn beauty of the site. The iconic lighthouse, a symbol of the Maritimes long before the MD-11 hit the icy waters around it, keeps shining its light not just on the site of a tragedy, but most importantly on a marvellous part of Canada that does not get the attention it deserves. I am keen to return, because Martimes are good times.